The Gamma & Density Co. Log Chart System is a modular and customizable chart system to provide cinematographers with a benchmark for color and exposure, while providing crucial information to DITs and Post-Production about how the Log or RAW images should be interpreted. Modular - use only the strips needed for the job! ON SALE IN THE GAMMA & DENSITY STORE! The original Gamma & Density Co. Rec.709 color chart is a model of image consistency in the industry. This chart has been used on hundreds of film and television productions and continues to be a top-seller. The Gamma-709 Chart is among the first charts to feature color bars calibrated to Rec.709 standard targets on a vectorscope monitor. The optimal design featuring an 8-step grey scale with a large key-grey target displays perfectly on a waveform monitor. 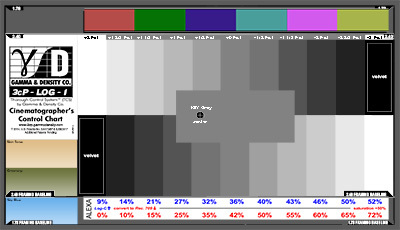 The chart, like all Gamma & Density Co. products, has been designed by cinematographers - for cinematographers, and includes many features that help provide image consistency on-set and throughout post-production. PURCHASE THE GAMMA-709 CHART IN THE GAMMA & DENSITY STORE! Why are our charts different, enjoying acceptance in more that 50 countries around the world and being used in productions ranging from multi-million dollar Hollywood blockbuster film and digital productions to students work around the world? Because they have features which no one else offers, not only showing you pretty pictures but guiding you and supporting you with objective data, helping you to navigate through the maze of today’s production and post-production. 1. The position of each Rec 709 color and each shade of gray on the waveform monitor and vectorscope is shown in voltage and percentage right on the chart, helping you to adjust the proper luminance (brightness) of the scene, camera gamma settings and related voltage output. 2. F-stops related to each grey field are shown on the chart. Each voltage or percentage field is calibrated in T-stops clearly marked on the chart. Those fields represent the practical latitude (density range) of current and future HD technology. It helps you to to make your own assessment and evaluation of the dynamic range of any digital camera or film stock and to control the transfer. 3. The Ramp (linear sweep) scale shows the relationship between voltage and brightness as a continuous line or characteristic curve. This curve is especially helpful when making knee, b/w balance and gamma adjustments. 4. Key Grey (±0 Fstop) which is not (necessarily) 18% for digital cameras. 5. The Black velvet patch serves as a reference for minimum “black” field voltage / percentage response. 6. Easily Recognizable Colors - greenery, skin tone and blue sky are included on our chart. Why do you need them? Rec 709 and other abstract color spaces are not connected to everyday human experience. How would you know that red in Rec 709 is more yellowish, and green is more bluish? But by simply looking at the “Easily Recognizable Colors”: sky, greenery and skin tone - the colors that people from all over the world readily agree on and experience practically every day – you can easily and quickly detect even the slightest variation from “norm” without any meter or other instrument. The presence of those colors on the chart also help to facilitate better communication between the cinematographer and colorist. 7. DIY testing of ISO and Dynamic range of any camera and film stock. The Gamma & Density Co. LOG Chart is designed to simplify the modern DP / DIT task of converting Log gamma to Linear Rec.709. By using magnetic camera specific data strips - this chart is custom configurable for all workflows present and future, using all different types of cameras. 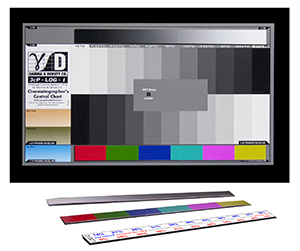 Tested and used on hundreds of productions - this chart is designed for professional digital productions that need true Rec.709 color rendition throughout the post-DI process.